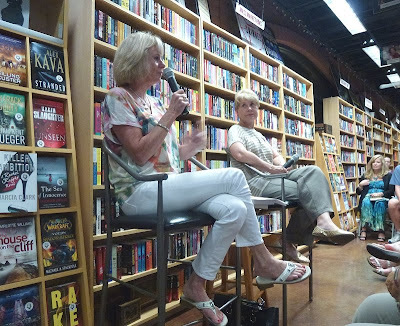 @ The Poisoned Pen with Kathy Reichs! It was Tuesday, September 3, and Denis and I were heading to my favorite bookstore, The Poisoned Pen. For me, this would be my fourth visit in less than a week-- and the second time in two days. At this rate every time I jumped into the Jeep, the trusty vehicle was going to head to Scottsdale by default. After years of having work schedules that prevented me from attending these author signings, it's wonderful to be able to go so often. Like the previous day's event for Louise Penny (no, you haven't missed my recap; it will appear next Monday), I expected a standing-room-only crowd today for Kathy Reichs, author of the Temperance Brennan mystery series, so we'd started out in plenty of time to be able to grab good seats. We did, although it did take me a minute or two to decide which ones they would be. The spot in which I prefer to sit isn't always the best one, since women with flyaway hair tend to sit in the seat in front of me. Flyaway hair seems to be drawn to a camera lens like you wouldn't believe, and there's been more than one photo that I've posted in my recaps that have had to have hair airbrushed or cropped out. Tonight we would be giving the front row a try! 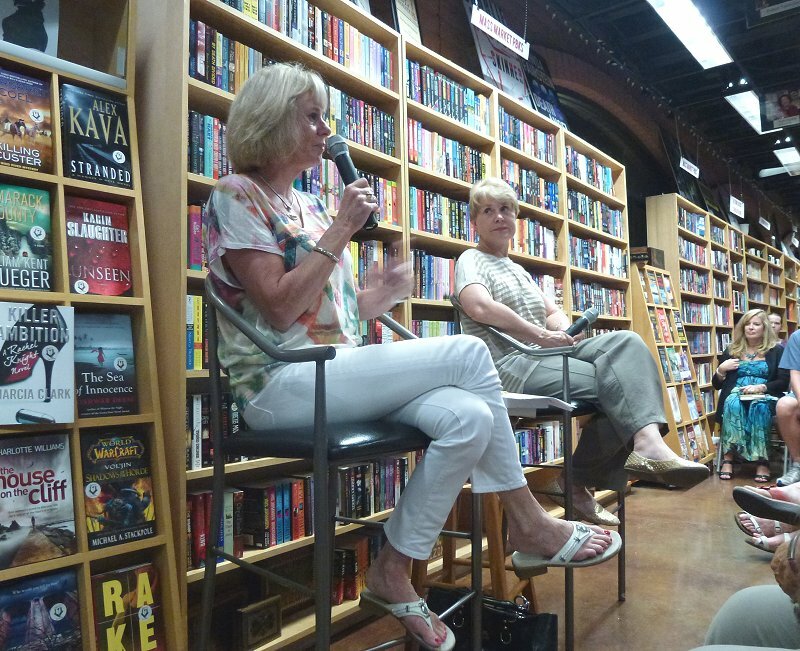 As the bookstore continued to fill, host and bookstore owner Barbara Peters shared a few tidbits with us. There were two reasons why she was pleased to see how many of us had packed in to see Kathy: two days earlier only twelve people had shown up at her signing (which completely stunned all of us), and although the publishing industry is extremely busy this year, book tours are being shortened or eliminated altogether. For shortened tours, this means that the well-attended signings will be the ones that stay on the itinerary. As the author took her seat, Peters reminded us that Bones of the Lost is the sixteenth Temperance Brennan book, and that the TV series Bones (loosely based on the books) is in its ninth season. 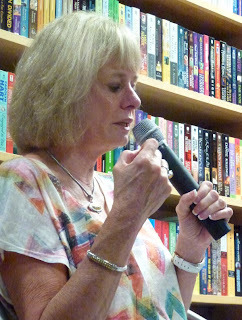 Kathy Reichs then started telling us about an episode of Bones that she and her daughter co-wrote. This episode (possibly airing on November 19-- doublecheck the date) will involve five clues from Bones of the Lost and a contest to be conducted on Twitter. "The Dude in the Dam" is definitely an episode for Hodgins, since it involves creatures like leopard slugs. And speaking of those lovelies and the joys of filming in Hollywood, they needed a leopard slug wrangler. (Hmm... I wonder how "leopard slug wrangler" would look on my resume?) In addition, they somehow managed to hire the only three working beavers in Hollywood, and one of those was due to a cancellation elsewhere. The cancellation happened to be an elderly, slow-moving, ill-tempered beaver that, nonetheless, turned out to be a bolter and caused a bit of difficulty during the filming. ("Bad day at work today, Maude. We had a runaway beaver.") Another special tidbit about "The Dude in the Dam"? Reichs' 2½-year-old grandson makes an appearance. Although she's no longer teaching, Reichs still keeps her work schedule between North Carolina and Canada and gets many of her ideas from the weird things that show up in her lab. Things like Peruvian mummified dogs or a case from 1969. She's also not the only writer in the family, although one daughter did go into the field of nursing. Another daughter writes, and a son co-writes a young adult series with Kathy. "I will never write about someplace I've never been," Reichs told us, which segued very nicely into her trip to Afghanistan as part of the USO and the International Thriller Writers effort as well as into her latest book. She flew into Afghanistan on a no-frills troop carrier with fellow authors Sandra Brown and Mark Bowden (Black Hawk Down). The authors each had to wear forty pounds of body armor, and the bathrooms were the length of a football field away from their rooms. Reichs laughed and told us that she always seemed to find out she'd left something behind once she'd made it all the way to the bathroom, while Sandra Brown always looked perfect. While they were there, Mark Bowden autographed one of the Black Hawk helicopters, which we all thought was really cool. Reichs looked up and saw fellow author Clive Cussler standing at the back of the packed space. Inviting him to say a few words, Cussler mentioned the "lovely food. My favorite dish was peanut butter, mayonnaise and pickles." When we'd finished laughing, Kathy told us that the servicemen would read through the list of authors who were there, and they'd all hurry over to get in Cussler's line. "The very first place I touched a skeleton..."
Kathy's about halfway through writing her next book, and the publisher has already told her that the cover will be red. (For you fans out there, the title will be Bones Never Lie.) Of course there are statistics for book cover colors. Red is the best color for a cover, and the worst color is yellow-- partly because it is unstable and changes hue over time. 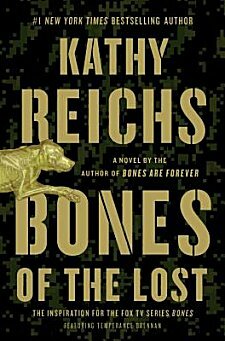 Reichs will be changing publishers after Bones Never Lie, and she's hoping to be able to keep to her current publishing schedule. Kathy's first manuscript was written in the third person, but she soon felt that it was boring and abandoned it. When she began writing in the first person, everything clicked. Peters said, "You're known as a novelist, but in the past several author events here, we've talked a bit about short stories. What's the difference to you between your novels and short stories?" Totally deadpan, Reichs replied, "You can't use nearly as many words." During the question segment, it was natural for people to ask about the television series, Bones. Reichs has input but no control with the series, and she always doublechecks the science. She's glad that the Jeffersonian in the series is really a stand-in for the Smithsonian because the Smithsonian was the very first place where she touched a skeleton. In talking about the two men in Tempe Brennan's life (in the books), Reichs suddenly announced: "Ryan or Pete? I want to see a show of hands!" followed quickly with "Who says kill 'em both?" to peals of laughter from the audience. She's understandably very proud of the fact that the Virals young adult series that she co-writes with her son is mandatory reading in some schools because the books teach both English and Science. Reichs also took the time to give thoughtful, incisive advice to a beginning forensic anthropology student in the audience. With a wry smile, Kathy Reichs told us that her son and daughter who write are both "recovering attorneys." Barbara Peters, a former attorney herself, nodded knowingly and exclaimed, "Publish or practice!" before the signing line began to form. It's so nice to see the authors behind the books I enjoy reading so much. Yes, they're all "on"-- they're all performing-- but it's not difficult to see the real person behind the actor's mask. It's also interesting to see the different answers to questions about the writing process, film rights, or the voices in the audio books. Those answers tell us what is most important to each writer. Like I said earlier in this post, I am so thankful that I'm able to attend these events. I enjoy showing support for the authors who've given me so much enjoyment-- and for the bookstore that makes it all possible! Cathy - How very, very lucky you are to be able to visit PP. Such a great place for books, meeting authors, etc.. I'm glad you had a great evening there. Just think the trouble I could be in if I lived right next-door! Another great author event! I love Reichs early books but haven't dipped into the series in a while. I have to admit that I haven't either-- but I am a fan of the TV series. I am a fan of this series (book and TV). I would have loved this event. One of the negative things about the town where I live. I know how lucky I am to be so close to The Poisoned Pen!